If you are an avid shopper, be careful about the abundance of browser extensions that promise to help you save money when you shop online. Deal4me is one of those new applications that appear to be useful, but in reality they simply bombard you with a number of irrelevant commercial ads. If you wish to avoid annoying commercial ads, you need to remove Deal4me from your computer ASAP. It is not hard to remove this application manually. At the same time, you should increase your computer security measures by investing in a reliable antispyware tool. Deal4me is very similar to Deal4Real, CoupExtension, DealEXpress and other adware from the same group. These adware applications are based on JustPlugIt engine. Deal4me has its official homepage at deal4meapp.info, but the download button does not work there. It is very common among such adware applications – rather than downloading Deal4me directly, users often install it via InstallRex (or Amonetize, Vittalia) installers. It means that Deal4me arrives bundled with freeware applications that you often download without any second thought from third-party websites. Although adware applications are not extremely dangerous, you should not take them lightly. There is also another feature common to Deal4me and all the other applications from the same family. Upon the installation, this program is known to randomize its name. For example, program names used by Deal4me include deAll4Me, dieal4me, daeal4me, doeAL4me and so on and so forth. It does not mean that all these programs are different. Deal4me simple uses different names, but in reality if you have several computers infected with the application, it is still the same program we are talking about here. Now Deal4me might tell you that with the add-on installed on your browser, you will be able to “compare between available deals and promotions with the new save on browser add-on” and that you will be able to “truly enjoy online shopping, totally worry-free.” It would be great if Deal4me could live up to its promises. However, according to various reports, Deal4me often does not even work! 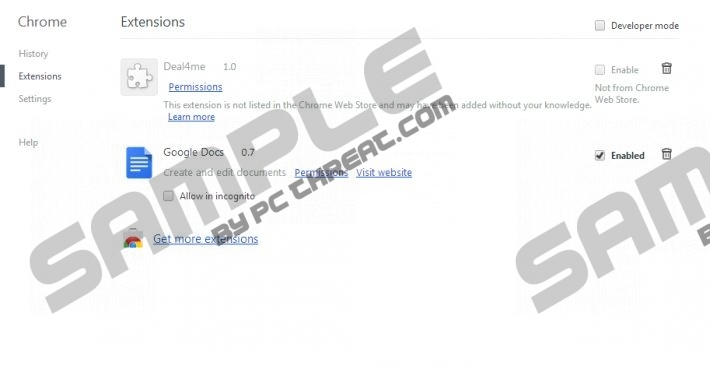 Also, newer versions of Google Chrome are known to block this application due to various security reasons. Hence, here we have a reliable proof that one should not trust Deal4me completely. Adware programs are created to generate financial profit for their developers. It is exactly what Deal4me is trying to do. Although it does not try to ruin your system in the process, it might happen especially if Deal4me inadvertently redirects you to unreliable websites or exposes to corrupted content. Therefore, you need to remove Deal4me from your computer immediately, and then perform a full system scan with SpyHunter free scanner. For any further questions, do not hesitate to contact us by leaving a comment below. And do not forget to get yourself a reliable antispyware application that would safeguard your system against similar threats. Highlight Deal4me and click Uninstall. Go to Uninstall a program and remove Deal4me. Select Add or remove programs and uninstall Deal4me. Disable and remove Deal4me from Extensions. Quick & tested solution for Deal4me removal.